# The ultimate quality choice when nothing but premium metal components will do. # Exclusive and patented all-climate tarp design that�s fully adjustable for easy use in cold weather. # NO drilling, NO damage! 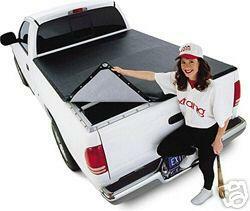 # Fast and easy access to truck bed & cargo by simply dropping tailgate or by rolling up the tarp. # The �TuffSnaps�� stainless steel and brass snaps will not break. Field tested & proven. # Easy, fast installation within minutes (no tools needed). # Famous Extang engineering, quality workmanship and excellent customer service. # Industry�s best warranties (10 Year Tarp - Lifetime Frame).